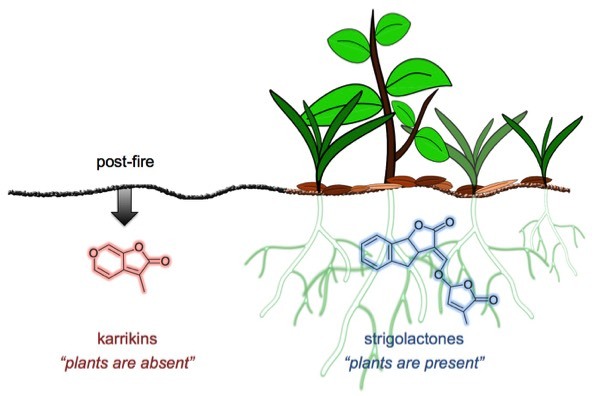 We are studying how plants sense and respond to karrikins and strigolactones, two classes of chemical signals that regulate plant growth through parallel genetic pathways. Fire dramatically reshapes ecosystems across the world. Fire is destructive, but as it also reduces competition for resources it provides a prime opportunity for recolonization. The dramatic flush of new seedling growth in the months following a fire - an increase in both the number of germinants and species present - demonstrates the importance of fire-adapted germination to landscape regeneration. The seed of some species of plants may wait decades for a fire to occur before germinating. Immediately after a fire in Kings Park in Perth, Western Australia (left). Several months later, thousands of Anthocercis littorea have colonized the area (right). This species had not been seen in the area since the last fire ~20 years earlier. But how do seeds recognize that a fire has occurred? Heat is an obvious product of fire that is particularly important for seed release in serotinous species (i.e. pines and banksia) or breaking physical dormancy in other species. However, smoke is now known to also play an important role in post-fire germination. Smoke applied directly to soil, or through smoke-water solutions is sufficient to stimulate a massive germination response, even in the absence of heat. Currently over a thousand plant species from 80 genera have shown positive germination responses to smoke, indicating that this is a broadly distributed phenomenon among angiosperms. Karrikins and an unrelated class of compounds known as cyanohydrins are two types of germination stimulants that have been isolated from smoke. Karrikins are a class of butenolide compounds found in smoke that stimulate seed germination. Treating seedlings with karrikins enhances their responses to light, and can improve seedling vigor and stress tolerance. Karrikins are produced by combustion of cellulose, and are therefore a constant feature of smoke from wildfires. Karrikins are thought to be deposited on the soil surface during a fire as part of a smoky residue, and then later solubilized and carried deeper into the soil by rain. The karrikins that have currently been identified in smoke. KAR1 is the most abundant karrikin and is the most active germination stimulant for many species. The red markings highlight the differences from the parent molecule. Strigolactones are plant hormones that control shoot branching, root development, and secondary growth of the cambium. Strigolactones also have an important role outside of plants: these compounds are exuded from roots into the soil to promote the formation of a beneficial symbiosis with arbuscular mycorrhizal fungi. This symbiosis is used by ~80% of land plants and is particularly important for plants growing in nutrient-poor soils. Parasitic plants of the Orobanchaceae family, however, exploit this fungal recruitment mechanism as a means to detect their hosts. The tiny seeds of these parasites lie dormant in the soil until they detect strigolactones, upon which they germinate and attach to the nearby host root. Dozens of strigolactones have been identified to date. It seems likely that selective pressures from the host-fungi and host-parasite relationships are driving diversification of this hormone family. Karrikins and strigolactones are both germination stimulants that have a lactone moiety as a defining feature. However, some seeds show very specific preferences for one type of compound. For example, parasitic plants germinate in response to very low concentrations of strigolactones, but ignore karrikins. The need for this discrimination makes ecological sense when we consider that karrikins essentially indicate “plants are absent,” while strigolactones signal “plants are present”; the first situation is clearly optimal for plants avoiding competition, and the second is optimal for parasites. There are further differences in response at later stages of development. 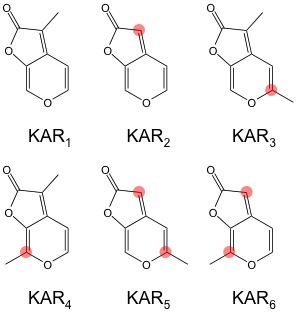 Karrikins cannot restore normal shoot branching to a strigolactone-deficient mutant, and these compounds have opposite effects on the growth of cotyledons. Therefore plants must have a means to distinguish between karrikins and strigolactones, and carry out specific responses to each. Arabidopsis thaliana is the ‘fruit fly of plants.’ It is a model system that is easy to work with in a laboratory setting, and has tremendous genetic resources. What we learn about gene function and regulation in Arabidopsis often applies to other plants that are agriculturally useful. Arabidopsis is not an obvious choice for studying post-fire germination, as it is found in regions with temperate climates and infrequent fires. Nonetheless, Arabidopsis seed and seedlings show clear responses to karrikin treatments. Strigolactones function as hormones in Arabidopsis, as in other plants, and can also stimulate its seed germination. Therefore we can apply the power of Arabidopsis’ genetic tools to study both karrikins and strigolactones. We are investigating the signaling pathway that connects karrikin and strigolactone perception to different growth responses in plants. As these signals control important agronomic traits (e.g. seed dormancy and germination, seedling vigor, root and shoot architecture, senescence), a deeper understanding of the underlying signaling mechanisms may lead to future agricultural innovations through biotechnology or plant breeding. We are using genetic and biochemical approaches to identify the molecular basis of karrikin and strigolactone responses. We discovered that although karrikins and strigolactones are produced in unique ways and have distinct effects on plant growth, both signals are recognized through parallel genetic pathways. In the current model of this signaling pathway two sister proteins, KAI2 and D14, are receptors for karrikins and strigolactones, respectively. In Arabidopsis, KAI2 regulates seed germination and seedling growth, whereas D14 regulates shoot branching. An F-box protein, MAX2, is necessary for responses to both karrikins and strigolactones. F-box proteins are known to target specific protein substrates for polyubiquitination and subsequent degradation. We discovered that SMAX1 (SUPPRESSOR OF MAX2) acts downstream of MAX2 to control seed germination and seedling growth in Arabidopsis. We hypothesized that SMAX1 could be a target of MAX2, and that other members of the uncharacterized SMAX1-like (SMXL) family might repress other MAX2-regulated developmental processes. We have found that SMXL6, SMXL7, and SMXL8 are partially redundant regulators of shoot branching, auxin transport, and lateral root density. Our data strongly suggest that SMAX1 is a target of KAI2 signaling, and SMXL6,7,8 are targets of D14 signaling. We are investigating how SMAX1 and SMXL proteins are regulated and how they in turn regulate growth. One hypothesis we are testing is whether SMAX1 and SMXL act as transcriptional co-repressors. This project is supported by NSF CAREER Award IOS-1350561. 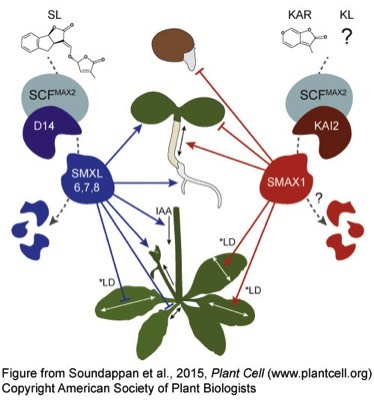 For additional reading, please see Stanga et al., 2013, Plant Physiology; and Soundappan et al., 2015, Plant Cell. We are studying how parasitic plants in the Orobanchaceae family, such as witchweed and broomrape, detect their hosts. It is well established that strigolactones trigger germination of these parasites, but the genes and mechanism of host-detection have been a longstanding mystery. Every year parasitic plants cause billions of dollars in agricultural losses in Africa, the Mediterranean, and parts of Asia. It is our hope that understanding how different strigolactones are recognized by parasites will allow us to create chemical or genetic methods to either block parasite germination or trigger suicidal germination. KAI2 is a karrikin-responsive receptor that regulates seed germination in Arabidopsis. D14 is a strigolactone-specific receptor, but does not function at early stages of development in Arabidopsis. We found that parasitic species have extra gene copies of KAI2. These genes can be categorized into three groups that have undergone different rates of evolution. 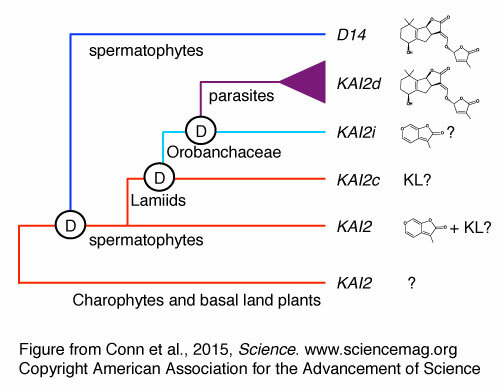 We found that a fast-evolving group of KAI2 genes in parasites (KAI2d) encode proteins with enlarged ligand-binding pockets, similar to D14, and are able to confer germination responses to strigolactones when introduced into Arabidopsis thaliana. These KAI2 genes allow parasitic plants to sense strigolactones from a host and grow. A similar evolutionary process may have given rise to the strigolactone receptor D14 in seed-bearing plants. We are now exploring how duplication and diversification within the KAI2 gene family may influence the host range of parasitic plants. For additional reading, please see Conn et al., 2015, Science. Although KAI2 in Arabidopsis can respond to karrikin signals, there is substantial evidence that KAI2 can also recognize an endogenous signal that controls seed germination and seedling growth. We suspect that this compound, which we call KAI2 ligand (KL), shares a lactone feature with karrikins and strigolactones, but there are otherwise no clues to its nature. We are searching for KL and the genes that make it.